Hope everyone had a happy weekend.We too had a good one.Its summer vacation for kids and both are enjoying playing at home and outside with their bikes.They have lot of fun activities to do and at times helping mom too.Today's recipe is a demand from my kids to have something sweet and they helped me in making balls too.Besan Laddus,another popular Indian sweet and easy to make.But this time,I opted to prepare this in the microwave as it looked very simple to prepare.Do try this out in 6 minutes and enjoy with your loved ones !! -Add 2 tbsp of ghee to the besan flour and mix well.Microwave on high for 3 minutes.Give a stir after each minute. -Then add 2 tbsp of ghee again and microwave for another 2 minutes giving a stir after each minute.It gives a nice aroma and don't over do it,just that it changes color slightly. -Take another bowl ,put the raisins and add ghee(1 tbsp) and then microwave for 45 seconds -1 minute. (The raisins puffs up and turns golden brown. -Mix the cardamom powder ,raisins and sugar.Give a quick toss. -Cool slightly & start shaping them once you can handle it.Add milk if required,that is if it doesn't hold shape. -Make laddus and serve !! * I have used the besan laddu flour.Its slightly coarse than the fine besan flour. * You can omit the milk and add ghee to in place of milk. * Keep a watch on the raisins from 45 seconds.Don't micrwave more than a minute as it gets harder after that. * The sugar available here is less granulated compared to the Indian supply.If you are trying this in India its better to powder or ground coarse and then add. 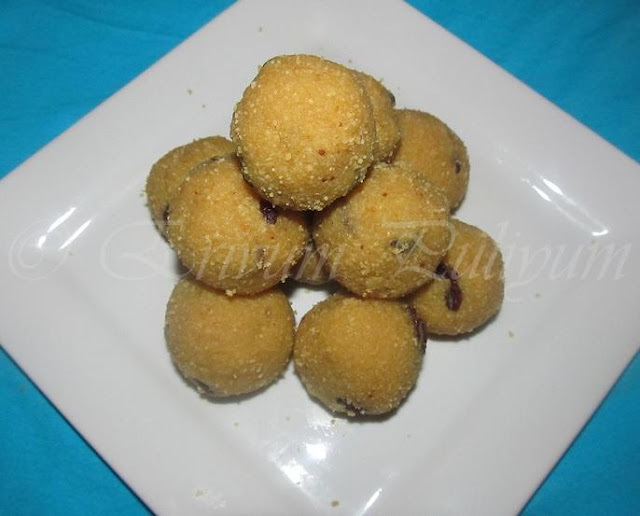 quick to make besan ladoo looks very simple to make with oven... nice presentation Julie.. These look too good and you made it so simple with the microwave! Perfect Ladoos!!! I love besan ladoos. Awesome Clicks as well. I am craving for some right now Julie. Looks superb. Besan ladoos tempt me to pick one....Looks yumm..
Besan ladoo is so popular in my family. I never make them because the Indian store always supplies the most delicious kind I have ever tasted. Yours looks like theirs. Yummy Laddoos! 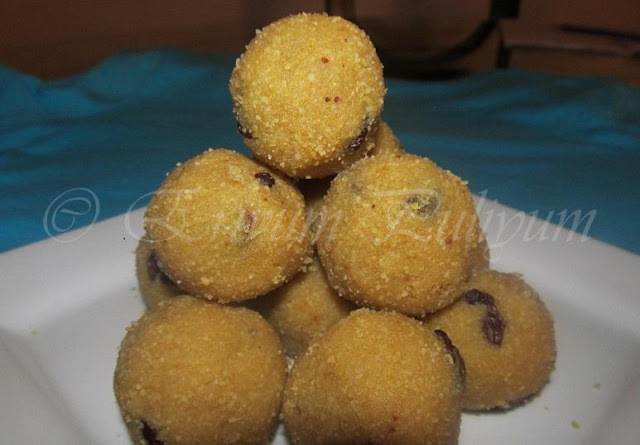 These r my all time fav :) Nice recipe dear..
perfect and delicious laddoo.never tried in microwave yet..will try this soon.. Thanks for sharing the microwave version of besan ki laddo...perfect! I like changed in your blog, rainy season theme. :) & thanks for sharing MW recipe. I have been wanting to try this version. Looks so good. The laddoos look cute and pretty..Can I grab few ? Wowo ladoo in MW and it looks good too. nice recipe,.. 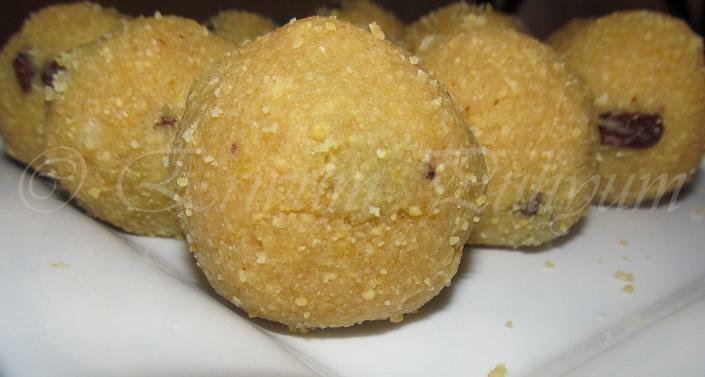 I've tried rava laddoos.. this looks very yummy..
ladoo looks really delicious, you made it perfect and all same size and shape. hi julie, great recipe, simple enough to follow.. must go look for besan flour, never tried this before. The laddoos look so yummy..inviting. 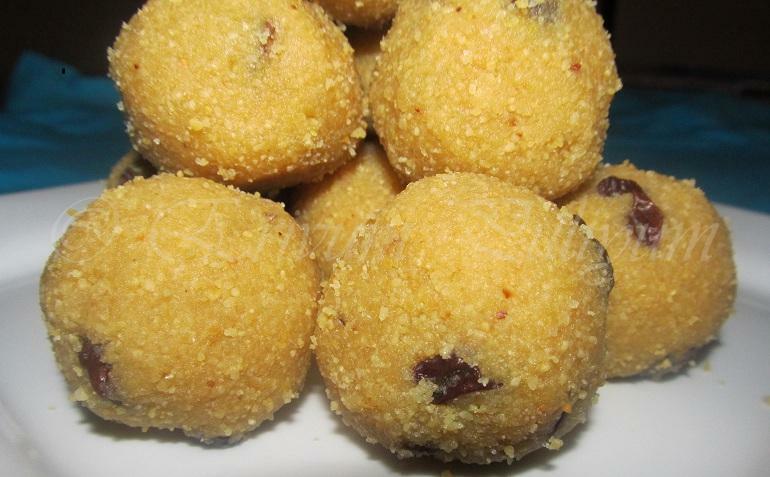 Thats a super delicious,addictive and prefect laddoos,thanks for sending to MEC Julie. perfect n yummy looking laddus, well shaped...haven't tried this besan laddu, recipe sounds simple n quick..will try it sometime! Ohh myy..that looks so perfect and tempting...YUmm! !